Hi and welcome to the Sarah Hurley inspiration blog. It's my (Clare) turn today to post where I'll be sharing a journal page which is part of my 'try something new' this year. And wait for it, I have only gone a dug out my Smash book which has been in hiding for the last 4 or 5 years, eeeeep....think I need a lie down! Here's how I created my page. 1 - Using black ink stamp the (Rainy Day) Charm Street girl directly onto your page. 2 - Create a mask and place it over the image. 3 - Now colour the entire page using Distress Ink. Here I used mowed lawn and broken china. 4 - Still leaving the mask in place, stamp random images around the page. 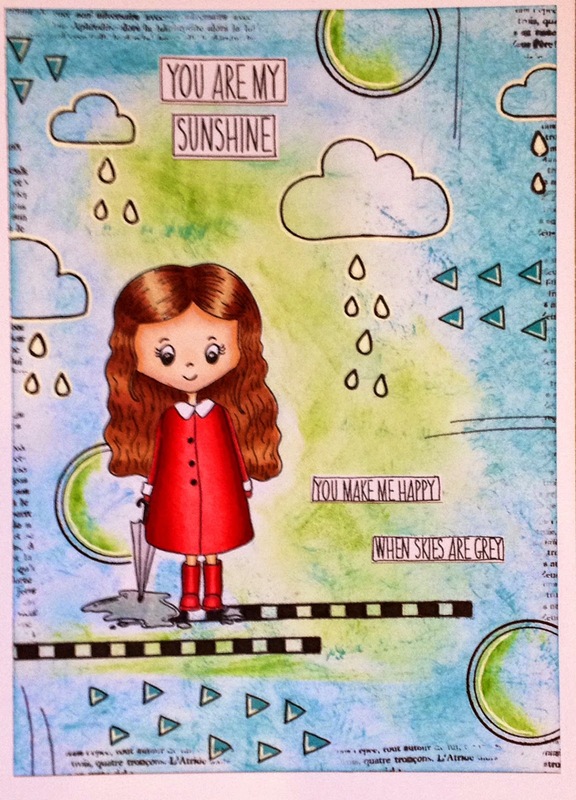 Here I used clouds and rain from from the Rainy Day Charm Street stamp set, circle from a previous 'AFOMFT' monthly kit. I also used a text stamp from the mini background stamp set. the stamp around my finger then pressed down on the paper. 5 - I now wanted to ground my image so I used the border stamp from my Ronnie The Robot stamp set (Special Editions). 6 - Next I created some lines, I've seen people use old credit cards, store cards etc but I don't have one so I used the edge of a piece of plastic that was lying around my craftroom lol. 7 - Using a stencil from a previous 'AFOMFT' kit and my broken china distress ink pad I created some triangles. 8 - Now it's time to add some detailing with the mowed lawn distress ink (inside the circles), a black fine liner pen and a white gel pen. I love how this makes the stamped images pop! stamp set onto white card then doodle a border using the black fine liner pen. Fix in place using double sided tape. 10 - Finally colour in the main image using pens or pencils of your choice.